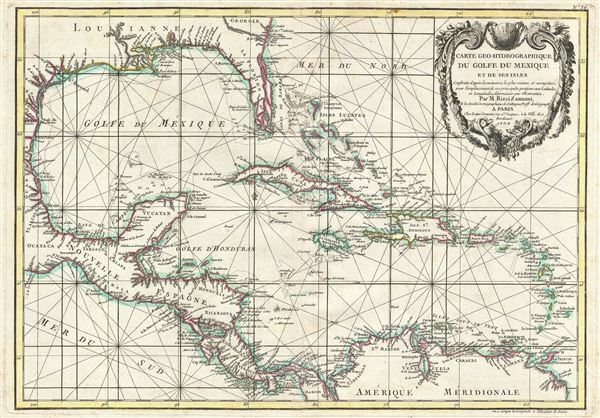 A beautiful example of Zannoni's 1762 map of the West Indies, Florida and Central America. Covers from the Gulf of Mexico to the Lesser Antilles including all of the West Indies, Florida and Central America, with parts of Louisiana, Mexico and northern South America. In essence a nautical chart, this map has little inland detail and is crisscrossed with both rumb lines and lines of latitude and longitude. Coastal cities, rivers and ports are named throughout. Also shows numerous shoals, reefs, and other offshore dangers. Southern Florida is rendered as an archipelago in a primitive attempt to describe the everglades. Drawn by A. Zannoni in 1762 for issue as plate no. 34 in Jean Lattre's 1783 issue of the Atlas Moderne.